Nook Color's Jailbreak: What Does it Mean for Barnes and Noble? Barnes & Noble's Nook Color e-reader will receive a software update in April, transforming it into a cheap Android tablet. 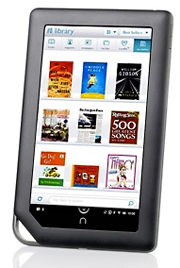 The Home Shopping Network (HSN) spilled the beans on the Nook software update via a product listing on its site. The Wi-Fi Nook Color costs $249 from Barnes & Noble, has a 7-inch color touchscreen, and runs on Google's Android mobile operating system. But the device is far from being a full-fledged Android tablet due to its lack of e-mail access, apps, a Web browser, and other standard tablet features (unless you hack the Nook Color). According to HSN's listing, the software update for the Nook Color will bring the e-reader closer to being a full-featured Android tablet. The patch is set to bring a Web browser (with Adobe Flash support) and an e-mail client. The Nook Color already features a music player and can play videos in MP4 format. Similar to Amazon's move into the app store market (for smartphones, so far), Barnes & Noble is also expected to introduce its own store for the Nook Color via this software update. Around eight apps will be available at launch "and more will become available after the April update." HSN's listing claims that customers who bought a Nook Color from them will be the first to receive the software update enabling the extra features, saying the new updates will be sent out automatically if the device is connected to Wi-Fi. If you're in the market for a cheap Android tablet and don't need a lot of processing power attached, a Nook Color might be just what you're looking for. At $249, the Nook is half the price of an iPad 2, and significantly cheaper than a Motorola Xoom. Now we just have to wait for Barnes & Noble to confirm this software update.